To avoid damage, never clean your polarized Polarized sunglasses with paper towels or clothing or alcohol, and also avoid using household detergents or soaps. While a few mild soaps don't harm lenses, today's extra strength soaps are powerful enough to slowly disintegrate lens coatings. 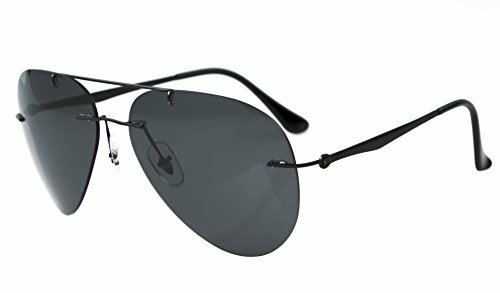 EYEKEPPER RIMLESS POLARIZED SUNGLASSES DESIGN: Eyekepper newest design creates a fashionable and powerful product; follows the latest style creating unique looks for mens and womens polarized sunglasses, offers a timeless model that combines great fashion styling with quality, performance and comfort. Protect your eyes with highly durable wrap-around lens and stylish frame. EYEKEPPER POLARIZED SUNGLASSES:-Included a microfiber Pouch.UV400 Rayblock and TAC Hard Polarized Coating.Eyekepper newest design creates a fashionable and powerful product; follows the latest style creating unique looks for mens and womens polarized sunglasses, offers a timeless model that combines great fashion styling with quality, performance and comfort. Protect your eyes with highly durable wrap-around lens and stylish frame. QUALITY POLARIZED SUNGLASSES -FDA Registered Sunglasses and Eyewear,Accord with ANSI Z80.3-2010,Accord with BS EN ISO 12312-1:2013 and EN1836:2005+A1:2007,Accord with AS/NZS 1067:2009,Eyekepper polarized 100% UV protection lens material filters out 100% of UVA / UVB / UVC & harmful blue light up to 400nm. By doing this the lens delivers greater definition, more natural color, and unmatched clarity to allow you to see more details; Insures optical clarity, visual fidelity and impact resistance. If you have any questions about this product by Eyekepper, contact us by completing and submitting the form below. If you are looking for a specif part number, please include it with your message.